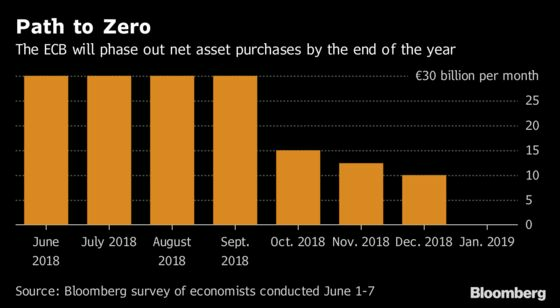 (Bloomberg) -- Mario Draghi is ready to end the European Central Bank’s bond-buying program even if he puts off the decision for one more policy meeting, economists say in a Bloomberg survey. Almost a third of respondents predicted the ECB president will set an end-date for purchases after next week’s gathering of the Governing Council, and 46 percent said he’ll do so at the July session. Either way, analysts are confident buying will be phased out this year, especially after Executive Board member Peter Praet confirmed a Bloomberg News report by signaling policy makers will hold their first full talks on whether to pull the plug on the stimulus tool. A decision to wind down bond-buying would mark the first step for Draghi out of crisis-fighting mode. The June 14 meeting in Latvia -- one of the occasional sessions held outside Frankfurt -- comes four years to the month since the ECB became the first major central bank to cut interest rates below zero. It followed up with cheap loans to lenders and asset purchases that will total 2.6 trillion euros ($3.1 trillion) by September. Economists predicted it will add 38 billion euros of debt to quantitative easing in the last three months of 2018, and reinvest the proceeds from maturing bonds for another two to three years. The ECB is still years behind the Federal Reserve in removing emergency stimulus. 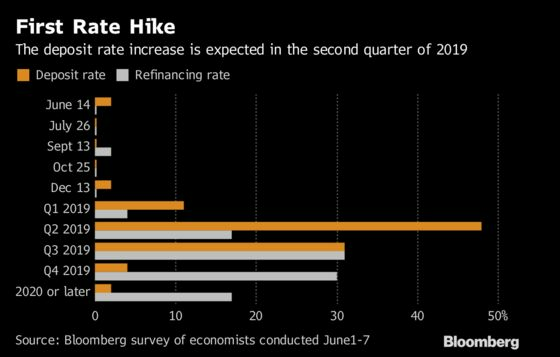 The U.S. central bank slowly started lifting borrowing costs in 2015 and is on course for at least two more interest-rate increases this year. While Praet reiterated his confidence in the euro area’s economic expansion and signs that inflation is gaining traction, policy makers will have to take into account a host of risks. 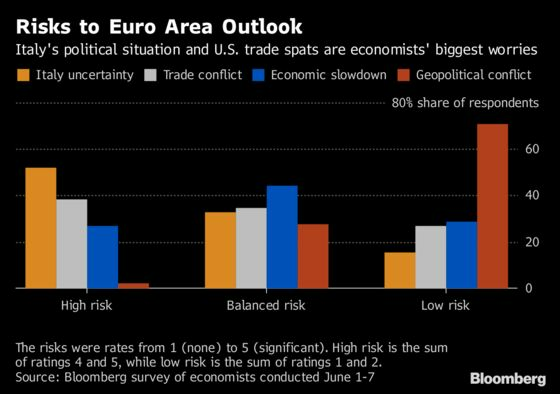 Economists cited the top two concerns as political uncertainty in Italy and a global trade conflict. Italian bond markets were rocked last week as the nation seemed to be headed for new elections that could be seen as a referendum on euro membership, and the government that was finally formed still has the potential to run into strife with the European Union over its heavy spending plans. Meanwhile, U.S. President Donald Trump’s administration, already embroiled in trade tensions with China, imposed steel and aluminum tariffs on the EU, Canada and Mexico on May 31. Both those external threats were ranked in the survey as more serious than the euro area’s domestic economic slowdown so far this year. Still, the bad news continued on Friday as Germany, the region’s biggest economy, reported an unexpected drop in industrial production for April. 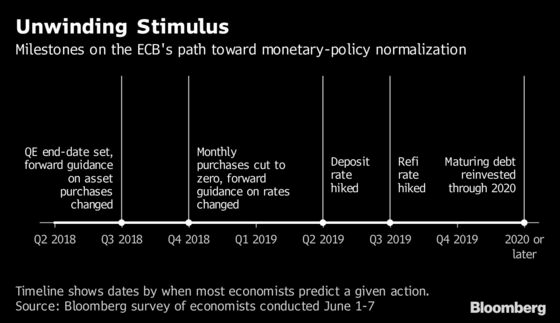 The survey suggests the ECB’s first interest-rate move will be to raise the deposit rate to minus 0.25 percent from minus 0.4 percent by the second quarter of 2019. An increase in the main refinancing rate, currently zero, is projected by the third quarter of 2019. The timings of both those forecasts are unchanged from the previous survey in April. Before then, policy makers will need to adjust their guidance that borrowing costs will stay on hold until “well past” the end of net asset purchases. Economists see that language being altered only in December -- right before buying ends and three months later than in the previous survey.